The greatest innovation in marketing will come "from the edges", making it a business priority to embrace neurodiversity, according to Direct Line Group marketing director Mark Evans. Speaking today (1 March) in London at #DiverseMinds, the neurodiversity conference created by Creative Equals and the Hobbs consultancy, Evans said: "The world is changing faster than ever. Specifically for the marketing industry we are being asked to be both left and right brain, but that full spectrum doesn’t exist in one brain." This is a state of play which Evans believes means everything in the middle (the repetitive tasks) will be done by AI. He added: "Where is the innovation going to come from? It’s going to come from the edges." Evans, whose own understanding and passion for the value of neurodiversity to business is driven by the fact that his daughter is dyslexic, urged marketers to raise neurodiversity up on their agendas, describing it as the diversity issue you can’t see. "We have to shout louder about this issue," he added. 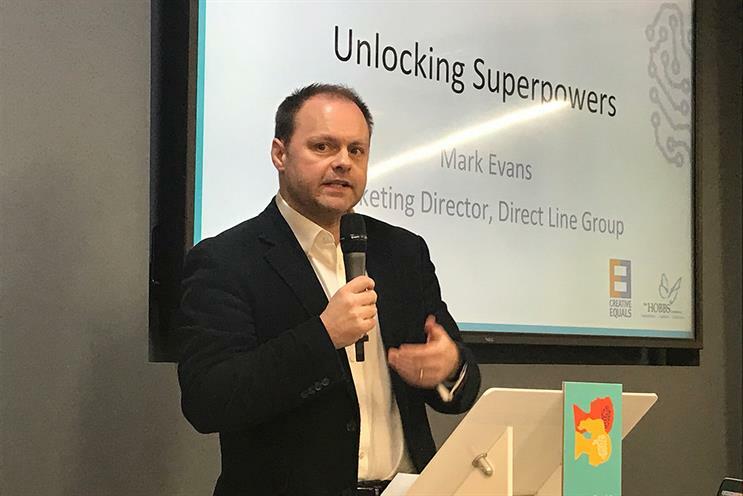 Evans described the ways in which Direct Line is tackling this challenge, from raising awareness and normalising issues internally to creating a balanced playing field for recruitment. According to Evans, recruitment is the biggest challenge to driving neurodiversity. He explained:"We have upfront conversations as to what will be helpful in the recruitment process. For example the job we were recruiting for wasn’t about thinking on the fly, so we didn’t have to interview in that way." He pointed to the example of Channel 4 as a brand that has led the way in this field. "They are great with upfront declarations and those employees who move ahead with this will benefit," he said. "Those that ignore this conversation will lose out on talent." Evans added that Direct Line is focused on giving the right support to individuals: "I don’t think people work for companies, they work for people." Pointing to the breadth and depth of neurodiverse talent, Evans said there remains a huge opportunity for brands to capitalise on this "raw talent". He added: "I think that something is changing in the world and today is a landmark day for that."